In May of 1918, nineteen-year-old Roy Blanchard marched toward the sound of artillery with the American 126th infantry Regiment on a narrow French road thousands of miles from his home in Grand Rapids, Michigan. World War I had been raging for nearly four years, sending millions of young men to an early grave. America's inexperienced "Doughboys," including Roy, were marching toward the Western Front, determined to help their allies hold the line against the coming waves of German soldiers. The artillery crashed louder around them as they approached the front. As Roy heard the deafening explosions, he wondered if he would have the courage to face a machine gun nest, suffer through hours of shelling, or charge "over the top. "World War I is difficult to grasp for many Americans. Most WWI soldiers didn't keep a diary, and few spoke of what they saw and experienced. Through Courage, listeners will understand what pulled the world into this devastating conflict, see why the United States came out of isolation to side with the Allies, and gain a personal look into the lives of WWI fighters. 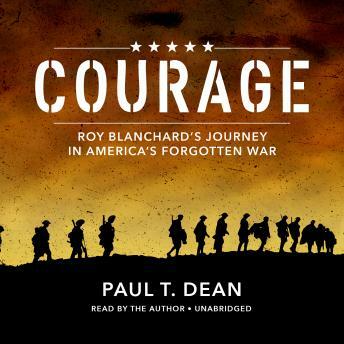 Through the eyes of Roy Blanchard, listeners will see, hear, and feel what it was like to bravely face the terror of the First World War.